The Tidal Basin is a man-made inlet adjacent to the Potomac River in Washington, D.C. It was created in the late 19th century as part of West Potomac Park to provide recreational space and as a means for draining the Washington Channel after high tide. Some of the city's most famous historic monuments are located here. The Jefferson Memorial, honoring our third President, sits on the south bank of the Tidal Basin. The FDR Memorial, a 7.5 acre park-like site, pays tribute to President Franklin D.
Roosevelt who lead the United States through the Great Depression and World War II. On the northwest corner of the Tidal Basin sits the Martin Luther King, Jr. Memorial, a monument honoring the nation's most recognized civil rights visionary and leader. Visitors are drawn to the area because of its beauty, especially during cherry blossom season in late March and early April. Each year people come from across the nation to welcome spring and to celebrate the National Cherry Blossom Festival. Tidal Basin Paddle Boats are available to rent on the eastern shore. A small concession stand offers hot dogs, a few sandwich options, drinks, and snacks. Walking paths surround the area and visitors are free to picnic along the shore. 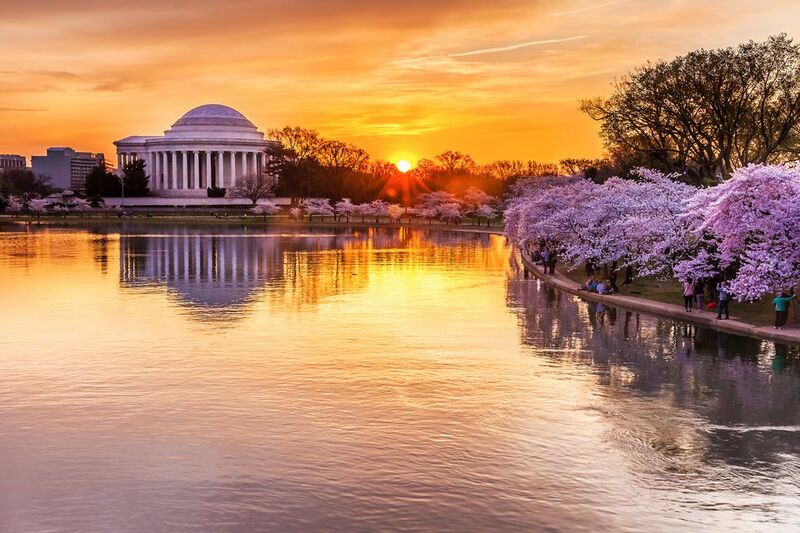 Approximately 3,750 cherry trees are situated along the Tidal Basin. Most of the trees are Yoshino Cherry. Other species include Kwanzan Cherry, Akebono Cherry, Takesimensis Cherry, Usuzumi Cherry, Weeping Japanese Cherry, Sargent Cherry, Autumn Flowering Cherry, Fugenzo Cherry, Afterglow Cherry, Shirofugen Cherry, and Okame Cherry. For more information about the trees, see Frequently Asked Questions about Washington, DC’s Cherry Trees. The best way to get to the Tidal Basin is to take the Metro to the Smithsonian Station on the Blue or Orange lines. From the station, walk west on Independence Avenue to 15th Street. Turn left and head south along 15th Street. The Smithsonian station is about .40 of a mile from the Tidal Basin. See a map of the Tidal Basin. Very limited parking is available in the immediate area of the Tidal Basin. East Potomac Park has 320 free parking spaces. The Tidal Basin is just a short walk from the park. Visit on a nice day so you can enjoy the views across the Tidal Basin or if you prefer to avoid crowds, visit at night as the memorials are open 24 hours. Attend a ranger-guided program and learn about the history of the city's famous landmarks. National Park Service rangers are on site to answer questions from 9:30 a.m. to 10 p.m. daily. Be sure to allow time to walk along the trail surrounding the waterway and to take photos. From the Jefferson Memorial, you can look across the waters and see the Washington Monument, the National Mall, and the White House. During cherry blossom season, avoid this area during the peak bloom and the middle of the day. Tour the memorials and walk along the Tidal Basin in early morning or in the evening.